Make sure to use a tripod when filming. If you don't have on, balance the camera on a hard surface. How many films have Scratchn Productions made? SP: Lego Adventure 2 - We get a sneak peek at the new film. Five years. That’s a long time, and that’s as long as Scratchn Productions has been operating. “ When we made our first film never in my wildest dreams would I imagine that in five years time we would be the company that we are today,” said Maxim Hussey, the current CEO Of the company. In 2008, he teamed up with Stephen Cavenagh to create their first film, My Video about Trams And Transport. Maxim has only five at the time but the film was still a success, and is still Stephen's Favourite film to date. Since 2008 we have made over 6 films including Bickie the Wonder Pig and I and M News, both of which screened at Little Big Shots this year. " We are hoping to release a new film around about christmas called New." Maxim said. In the coming months, SP mag will give you an exclusive preview of the film before anyone else. At just 11 years old, Maxim Hussey knows a thing or two about the highs and lows of the fickle film industry. Last year, Hussey won an award for best cinematography and received a trophy in the shape of a beautiful golden galah. But when his leading man died on the operating table, Hussey learned the hard way that the big screen isn't just about glamour. 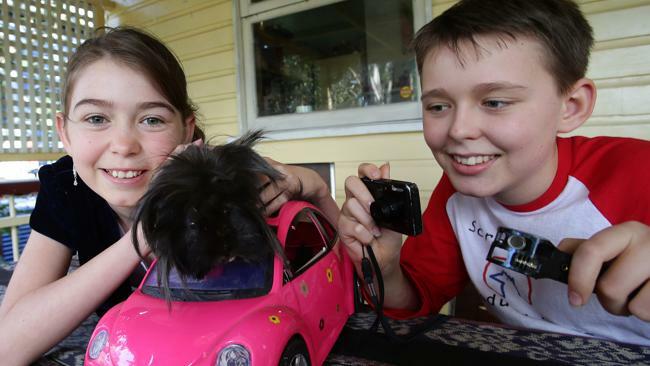 Bickie the guinea pig, apart from being the pet of Hussey and his sister India, starred in two of Maxim's films. He was in the five-minute Evil Pig, the film for which Hussey won the cinematography prize at the 2012 Fist Full of Films festival in Darwin. In Evil Pig, Bickie is mysteriously delivered to a man's door. The animal leaves his bullet-shaped calling cards all over the place, including in the man's coffee cup and hair. But Bickie's second film, Bickie The Wonder Pig, would sadly be his last. "He had an operation, but he didn't come through," Hussey says. Bickie might be no more, but his whiskery charms will live again when Bickie The Wonder Pig is screened in the Little Big Shots children's film festival at the Sydney Opera House from August 2-4. In the film, directed by Hussey, Bickie rescues a little girl who is stuck inside her room. The girl is played by India. Bickie was an acting natural. "You could plonk him down anywhere and he would stay there. He never minded about anything as long as he had something to eat," Hussey says.